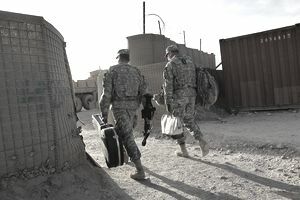 Chaplain Assistants, also known in the Army as Religious Affairs Specialists, act as counselors for their fellow soldiers and provide backup to Army chaplains. This job, which is military occupational specialty (MOS) 56M, does everything from preparing spaces for worship to managing supplies. There's a long list of duties for religious affairs specialists, most of which center around supporting the chaplain. This job isn't just about leading other soldiers in prayer or attending to religious services. These soldiers synchronize religious support in their contemporary operating environment. That means it's up to the chaplain's assistant to help the chaplain determine what religious practices may or may not be appropriate in a given area where a unit is deployed, for instance. They also coordinate and help provide security for any operations involving indigenous religious leaders. Like their civilian counterparts, soldiers in MOS 56M is responsible for safeguarding privileged communications, conducting crisis interventions, and coordinating traumatic event management, to ensure soldiers get the counseling they need in difficult situations, such as combat stress. Religious affairs specialists also provide emergency ministration when needed, such as last rites or other urgent religious counseling, and manage religious support resources. This can range from overseeing religious property, equipment, materials, and funds. Regardless of their particular denomination, these soldiers coordinate religious support for soldiers of all faiths. Job training for a chaplain assistant position requires ten weeks of Basic Combat Training, (also known as boot camp), and six weeks of Advanced Individual Training (AIT). Chaplain assistants get their AIT at Fort Jackson in Columbia, South Carolina. During AIT for this job, you'll receive training in skills like grammar, typing and other clerical duties. You'll learn to conduct correspondence according to Army protocols and style, and receive instruction in religious history. You'll need to score at least a 90 on the clerical area of the Armed Services Vocational Aptitude Battery (ASVAB) tests. Since you'll be handling potentially sensitive information, you'll need a secret security clearance from the Department of Defense. This entails a security and background check, and some past drug offenses or drug use may be disqualifying. Your record must be free of any convictions by court-martial and have no civilian convictions within two years other than minor traffic violations. Even though your role has a religious component, you'll still be expected to carry out the duties of other soldiers, including bearing arms and participating in combat situations. A soldier in MOS 56M should be able to type at least 20 words per minute and have a valid driver's license. The obvious career path is becoming a member of the clergy, which will require additional study and certification, but you'll be well on your way after your Army training. You'll also be qualified to pursue work as a counselor or psychologist, after completing the required licenses and any additional training.